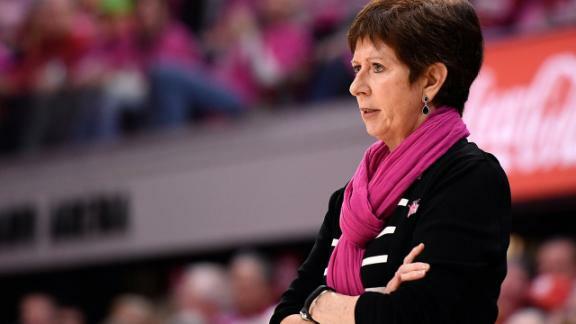 Will Notre Dame women's basketball coach Muffet McGraw ever be able to enjoy success more than she fears failure? Less than three minutes remain until tipoff and Notre Dame coach Muffet McGraw is a wreck. She sits on the Fighting Irish bench, her knees pumping up and down like pistons in a V-8. She stares at the floor beneath her, either unwilling or uninterested in looking at any of the nearly 9,200 people around her in Purcell Pavilion. Her day began with the customary 5K jog with her neighbor, but she barely slept the night before, hasn't eaten much of anything and refuses to turn on her cell phone. In the hours leading up to the game, she hid in the closed-door bubble that is her office, playing solitaire and other puzzles that take her mind away from basketball. Everyone who knows her knows it's best to leave her alone. You would think Notre Dame's opponent is rival Connecticut with a national championship on the line. Instead, it's 11-17 Virginia, ranked No. 12 in the ACC and playing without its injured 6-foot-9 center. McGraw's No. 4-ranked Fighting Irish are 26-3, the reigning national champions and feature five potential WNBA draft picks. On paper, it's a lopsided ACC matchup, which makes McGraw all the more anxious. It's also senior day, with junior Jackie Young ceding her starting role to senior walk-on Maureen Butler. McGraw fears a catastrophe -- the seniors come out emotional and unfocused, there's an injury and foul trouble and lazy defense, and Virginia can't miss, and two hours later the unthinkable has happened. It would all be on her. "That's how I look at it," McGraw says. "If we aren't ready, if we don't play to our potential, it is absolutely my fault." The good news, or, depending on your perspective, bad news, is that this pregame paranoia is standard. McGraw has been this way since the first college game she coached at Lehigh 37 years ago. She used to escape by walking the mall on game days. Then she cleaned the house. Now she buries herself in a movie, book, puzzle or game. "When I think about how many game days I've had, that's 1,100 days of my life that I've spent in a cocoon of stress," McGraw says. "I could have been ... I don't know ... living." Instead, she has been winning. In December, McGraw won the 900th game of her career, against Lehigh no less. This March she's coaching Notre Dame in her 25th NCAA tournament and is two wins away from taking the Irish to their ninth Final Four, the third most of any active coach. In 2017, McGraw was inducted into the Naismith Memorial Basketball Hall of Fame, and in the wake of Tennessee coach Pat Summitt's death in 2016 has become the prominent, take-no-crap female voice in the game. Yet every game day she has fought that battle of her own. She knows the stress isn't healthy. Her assistants worry about her. Opposing coaches have teased that she looks as if she's going to have a heart attack. It makes you wonder: Is it somehow possible, before her career is through, that Muffet McGraw can figure out a way to enjoy her team's success more than she fears its failures? "We'll see," she says. "I'm working on it." The morning before the Virginia game, Muffet and her husband, Matt, squeeze into a corner booth at a popular South Bend greasy spoon. Their personalities couldn't seem more different. Muffet is a self-described introvert -- direct, honest and methodical, almost to a fault. "We did personality tests once and it came back that I would have no trouble firing people," she says. "I hurt people's feelings and don't even realize it." A few years back when one of her players transferred, she told McGraw that the coach was never satisfied. She always wanted more. "I told her that was true," McGraw says. "She needed to do more. And she wasn't giving it to us." Matt is the social chair of the couple, shaking hands and talking with seemingly everyone before games and holding court in hotel lobbies on the road while his wife stays back in the room. Matt cooks the meals. Does the dishes. Takes care of the house. As the calendar turns to March, both of them know the stress levels are about to climb even higher. For Muffet, it means quality sleep will be hard to come by. "A lot of the time I just lay there and worry," she says. "Losing," she says. "I hate losing. I hate it. Losing is failure." It isn't hard to find stories about Muffet's perfection-driven competitive fire. Everybody has one. Matt tells the tale of the time he hit a hole-in-one on the ninth and final hole of a round of golf the couple was playing. They started laughing and celebrating until Muffet realized what that meant. "She looks at me and goes, 'I can't win this now, can I?'" Matt recalls. "And I told her, 'You need a hole-in-one to tie me.' She stopped laughing immediately. It was like a movie. I think she hit her tee shot and as soon as it didn't go in the hole she was like, 'We're done. Let's get out of here.'" When Muffet hosts game nights at her house, her players and assistant coaches insist she stacks the teams so she can win. "For sure," assistant coach Beth Cunningham says. "And you keep playing until she wins." Muffet laughs at the accusation. "That's so not true," she says. Sitting in the booth next to her at breakfast, Matt nods his head up and down and mouths the words, "Yes it is." "With coach, nothing is ever just for fun. Everything she does is to win," says Niele Ivey, who played for McGraw and is now one of her assistants. "She's the most competitive person I've ever met. At everything." Before this season, McGraw took her basketball staff to an escape room in South Bend, where the group had an hour to figure out a series of riddles and puzzles that would crack a code allowing them to escape. But when one member of the group failed to properly open a lock, the group didn't get out of the room in time. McGraw was livid. "I said to the guy when we left, 'Didn't somebody tell you, when we leave, we have to win?'" Cunningham said. "'Because now it's going to make the rest of our day miserable. We just can't lose like that.'" McGraw says she escapes the stress in her life by working in her garden. Matt shakes his head, chuckling. "Yeah, but even that is competitive," he says. "Competitive gardening. That's her offense in the offseason. She can move this plant here and that plant there and then a couple weeks later she decides it's not working so she changes it up again." Later, sitting courtside at practice, Matt tries to explain exactly why his wife is the way she is. Part of it is growing up one of seven kids. Part of it is simply the way she's wired. He says she once didn't approve of the way he loaded the refrigerator so she taped a sign designating one particular shelf "for drinks only." "She's the puzzle maker. Always has been," he says. "Everything to her is a giant puzzle. On the basketball floor, in the garden, the refrigerator. She knows everything. She remembers everything. She's the smartest person I've ever known. And she never wants to lose. At anything." After winning the title last year, Notre Dame entered this season as the preseason No. 1 team. Five months later, the Fighting Irish enter the Virginia finale with a Notre Dame record: the first team to lose two regular-season ACC games, after upsets at North Carolina and Miami. On both nights, McGraw says, the team wasn't focused and didn't play to its potential. A lackadaisical practice 24 hours before playing the Virginia game didn't help McGraw's nerves. "With this team, I just never know what to expect," she says. She gives her team final instructions and sends the players onto the court for the opening tip. She retreats to her chair, sets her elbows on her knees and her feet start bouncing off the floor once again. Just before the tip, she slides off her chair and kneels on the hardwood floor. As the ball goes up, her shoulders fall. The game has begun. The stress is gone. "In a very fundamental way it's about control," says Jack Swarbrick, the Notre Dame athletic director. "It's the moments where she doesn't think she has control where her anxiety is at its greatest." The Irish jump out to a 16-2 lead and are ahead 53-33 at halftime. Virginia is clearly overmatched. But McGraw isn't pleased with her team's execution. She walks off the court staring down at the floor, shaking her head. "I don't think she knows what the score is half the time," forward Brianna Turner says. "If we win by 20, it's why didn't we win by 30? Even the walk-ons she'll be yelling at and I'm like, 'Geez, they're walk-ons.' She never settles. She always wants more. But I love it. That's why we succeed." And this is the supposedly mellower McGraw. After becoming a mom -- their son Murphy arrived in April 1990 -- and watching the coach-player relationship from a parent's perspective, she insists she has relaxed over the years. She also says she has had to adjust her style to the far more sensitive millennial generation. "When I started coaching I was more of a dictator, and now I'm much more of a collaborator," she says. "I ask a lot of questions. I look for input. Today's generation needs to understand 'why.' So you want them to feel a sense of ownership in what they're trying to do." Now, when her former players come back to campus and watch practice they're taken aback. "Soft -- that's the word they use," Cunningham says. "But that's not fair. She isn't soft. She's just different. She's evolved her style so it works with the kids today. I think it's one of the reasons she's been able to be successful for so long." Notre Dame ends up defeating Virginia 103-66. Afterward, former walk-on Karen Hahn and her high school team from Westlake, Ohio, are waiting in the lobby of the Notre Dame women's basketball office, along with a handful of neighbors and friends, the group the McGraws meet with after every home game. "That's my support group," Muffet says. "They are always on my side, win or lose." But even so, she acknowledges she can't hang out with them for much more than half an hour before she's itching to get home. "The introvert in me just wants to have a cup of tea, sit down alone and watch the game," she says. "So I end up staying for a few minutes, perhaps playing a game and then I have to go. That's just me." Last May, as he introduced McGraw as the 2018 winner of the New York Athletic Club Winged Foot Award, given to the men's and women's national championship-winning coaches, Swarbrick pointed out the Irish lost more players to season-ending injuries in 2017-18 (four) than they did games (three). He ran through McGraw's decorated résumé and cracked a joke about her inability to cook much of anything. Then he mentioned how her birthday, Dec. 5, 1955, was the day the Montgomery Bus Boycott began, four days after Rosa Parks refused to sit in the back of a city bus. He talked about McGraw's vision, determination, leadership, and read a quote from a news conference after a 2014 game. "One of the things I try to teach the [women on my team] is that you gotta fight," Swarbrick read. "You gotta fight for what you want. You gotta fight for playing time. You gotta fight to win a national championship. You have to be willing to stand up and fight. And you have to be accountable in that fight. And that accountability doesn't end when you leave the locker room. It is not just about basketball. Basketball is just a game. The thing that it teaches you is about life. And these are the lessons I want them to learn. I want strong, confident women who are not afraid to use their voice and take a stand." The fact that Swarbrick chose that quote, from that game, was telling. That was the night McGraw's players wore black "I Can't Breathe" T-shirts during pregame warm-ups, a reference to the final words Eric Garner uttered before he died after a chokehold was applied by an arresting police officer. The unified message from the Fighting Irish women's basketball team was clear: Black lives matter. We support civil rights. The decision created a firestorm of controversy in South Bend and a PR headache for Swarbrick. McGraw later met with representatives from the Indiana State Police, South Bend Police, Notre Dame security and others to listen to their frustrations and assure them the team was not anti-police. "There were ugly emails," she says. "Some supported us, some didn't. But I wanted them to know, yes, we believe black lives matter. But blue lives matter, too. It was far more controversial than I expected it to be, but I'm still glad we did it." Turner was a freshman on that team. "The fact that coach allowed us to do that, to give that opportunity to young women to use our platform as athletes to voice something like that said so much to me," she said. "She could have easily said the court is not the time to make a statement like that. But she didn't. She encouraged us to use our voices." Last fall, before the midterm elections, McGraw and her staff researched the out-of-state voter registration procedures for her players. She encouraged everyone to follow through and vote in their home states. And they all did. 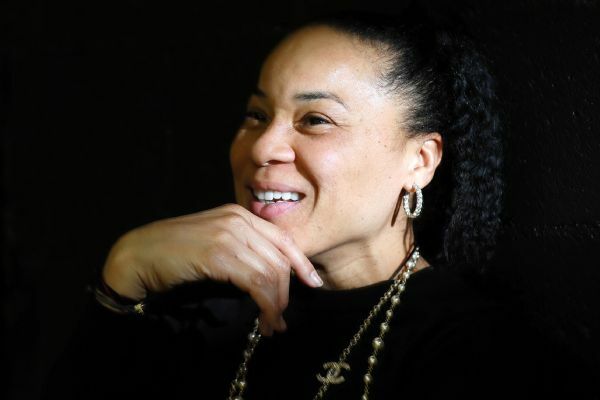 "She's just so socially conscious," assistant coach Carol Owens says. "It's what I like most about her. She's all about equality for women and people of color. It's a passion." One week after beating Virginia, Muffet and Matt sit together on the team bus in their customary fourth row to the right, Muffet next to the window. The team is heading to the Greensboro Coliseum for the ACC tournament championship game against Louisville. Matt senses the anxiety radiating from his wife, so he grabs her hand, shakes it and says, "I'm taking all the pressure off of you." They both laugh. This has become the big-game routine for a while now. "It totally helps calm me down," she says. "For about 10 seconds." Jokes Matt: "I'm not even sure she knows whose hand it is." Muffet slept on-and-off for only a few hours the night before, crashing at 8:30 p.m., waking up at 11 p.m. and tossing and turning until catching a bit more sleep sometime around 5 a.m. The game is an opportunity to return the ACC tournament trophy to South Bend after losing to Louisville in the same game a year earlier. Louisville plays a tough, physical brand of basketball, and the rivalry between the teams has grown over the years. Louisville coach Jeff Walz is one of several prominent male coaches in the game today, and although McGraw says she never looks at a game as a one-on-one matchup against another coach, she and her all-female staff take great pride in competing against male-coached teams. 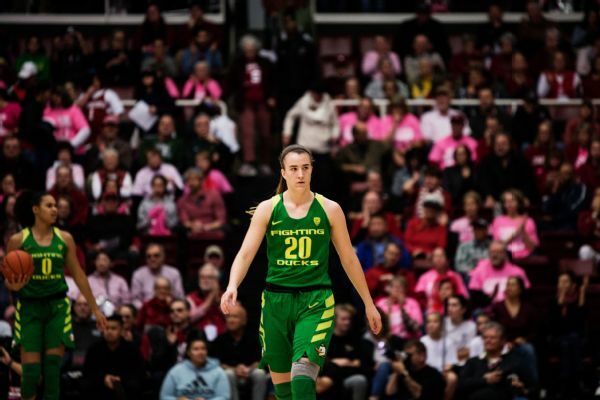 They were well aware entering last year's regional final against Oregon that had Notre Dame lost, there would have been four male head coaches in the women's Final Four. Instead, Notre Dame beat Oregon and then defeated Connecticut in overtime and Mississippi State to win the title. All six of Notre Dame's tournament wins came against teams coached by men. And Notre Dame was one of a few schools in the tournament with an all-female staff. "It's important for women," she said. "There are too many men who have the platform. I think about that a lot. Last year women were cheering for us for just that reason. There are a lot of men. 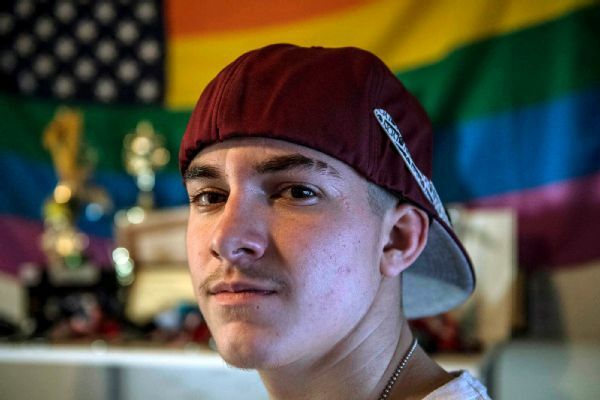 I feel we need to stand up and be heard." For four decades, it was Tennessee's Pat Summitt who filled the role of the game's prominent female voice. Summitt was diagnosed with early-onset Alzheimer's in 2011 and died in 2016. After that, Swarbrick reminded McGraw that the role was now hers. "I wanted her to make sure she was seeing herself in those terms," Swarbrick says. "She took to heart that role and sees herself as a leader of women." Says McGraw: "You're never going to replace Pat. She is missed every single day. But in her absence there was this void, and I wanted to start talking and saying these things about women. Things I already believed. People aren't going to always agree with it. But I'm going to put it out there and if you want to attack it or whatever, then go ahead." When Title IX was enacted in 1972, more than 90 percent of women's sports teams were coached by women. Today, that number is around 40 percent. McGraw's own school isn't immune from her criticism. Notre Dame currently has five female head coaches for its 11 Division I sports. "It's disappointing," McGraw says. Swarbrick says that whenever he hires a male coach for a female sport he can count on a conversation with McGraw. "I love that," he says. "I love that she holds me accountable." McGraw has more than 50 former players coaching at all levels of the game today. 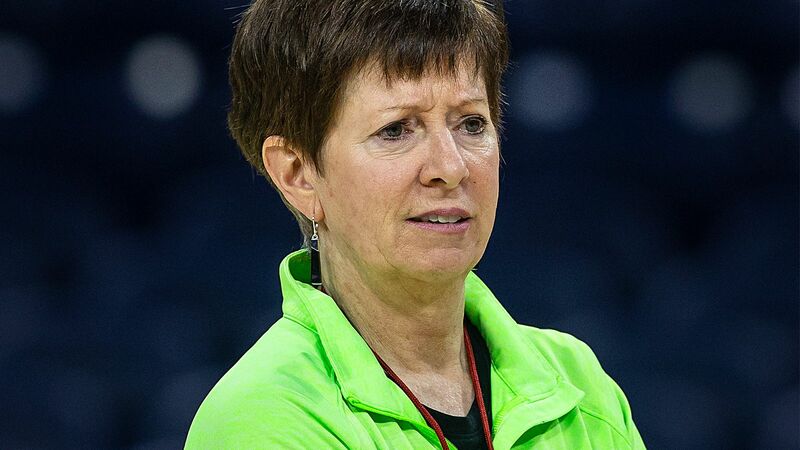 Once a month, McGraw and the other four women in head-coaching positions at Notre Dame meet for lunch to lean on one another, talk about what they're dealing with and see whether they can help solve one another's problems. "She's the ringleader. She's the one making sure we take care of each other," Notre Dame softball coach Deanna Gumpf says. "There's not a coach out there who doesn't struggle. But every time we have lunch, you realize you're not alone. She's great because she isn't afraid of anyone or anything." Against Louisville in Greensboro, McGraw's team would continue its postseason run against male-coached teams, leading Louisville from the opening tip and never trailing in a 99-79 victory. Afterward, as confetti and balloons fell from the coliseum rafters, McGraw pulled in her three assistants for a hug. They smiled. A few minutes later, they took turns climbing the ladder and cutting down the championship net, something they hope to do twice more in March. Notre Dame head coach Muffet McGraw plays "Swish or Brick"
Eight days after winning the ACC tournament, with a little more than two hours until the 2019 NCAA tournament puzzle is revealed, McGraw's team practices on the Purcell Pavilion floor when a staffer informs the coach the bracket has mistakenly appeared on ESPNU and that the selection show will start early. The players beg McGraw to let them run to the locker room to quickly shower, change and head to a VIP lounge where a watch party was scheduled. McGraw just wants to practice. "What's the big deal?" she asks. "We already know where we are going." But the players want the party, even though there won't be anybody there. At least not for a while. McGraw caves. And the players sprint off the court and head to the locker room. No matter the puzzle the NCAA women's basketball selection committee spits out, you can typically count on one thing in the NCAA tournament: Notre Dame facing Connecticut. It has happened in six of the past eight tournaments, twice for the championship. The rivalry is one based on respect and fierce competitiveness. McGraw and Connecticut coach Geno Auriemma have known each other for more than 40 years. But given McGraw's competitiveness, directness and fight for female coaches, it's no surprise that she and the button-pushing Auriemma have traded barbs over the years. "I just think he likes to have somebody to bully," McGraw says. "It was Pat for a while. I don't back down from him. And he is always right. That's what he does. He's part of the old boys' network that is pretty strong. They get away with more from the officials, they can say things to the players that they would never take from a female coach. That's just the way it is." Before the 2014 national championship game, which both teams entered undefeated, Auriemma explained the tension in his relationship with McGraw is a byproduct of the women's game: "We're supposed to play each other, try to beat each other's brains in, try to win a national championship and compete like hell, Muffet and Geno. And then we're supposed to get together afterwards and go have a bottle of wine?" he said. "That s--- is just not going to happen." The biggest news on selection Monday also involves Connecticut -- the Huskies are a No. 2 seed for the first time since 2006. When Notre Dame's No. 1 seed in the Chicago Region is announced, there is applause and a few smiles. Soon, the TV analysts share their thoughts on the Irish. It's nothing but praise. They are the hottest team in America. Jessica Shepard can't be stopped down low. Jackie Young can do it all. The starting five is unmatched. The Notre Dame players hear every word of it. McGraw sits there, expressionless. You would assume she hates that her players are hearing all this before they begin the toughest, most important month of the season. But you'd be wrong. "Honestly, I'm proud of it," she says. "Usually I'd be freaking out that everyone is overselling our team. But you know what? I feel like we are playing really well right now. We are a powerful offensive team. We do have a bunch of offensive weapons." Could it be? A new Muffet McGraw? "Maybe it's time I trust my players rather than doubting myself and worrying about screwing it up." Wayne Drehs is a senior writer for ESPN. He can be reached at wayne.drehs@espn.com. Follow him on Twitter @espnWD. Also by Wayne Drehs: Grounds for Return. And Lewis Hamilton living the hell out of life.